The Musician’s Bench is deceptively simple, as it is designed out of three pieces of wood, but it is quirky in its shape and dimensions. The top is 5/4 Walnut and the legs are 7/4 Ash. 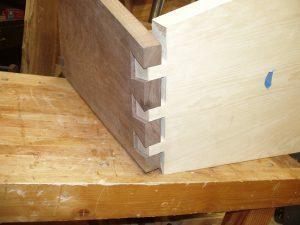 The dovetails are hand cut. 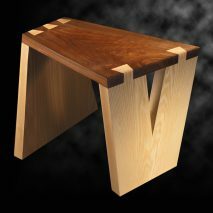 The Musician’s Bench was featured in the “Woodworker’s Showcase” section of “American Woodworker Magazine,” June/July 2008.